And You Thought Flies Were Hard to Swat Before! Spotted this in the June 2006 issue of IEEE Spectrum that arrived today. 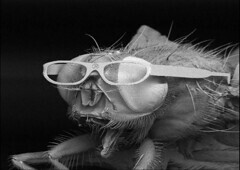 Yes, that’s really a pair of micro- machined eye glasses on a fly. Source: Micreon GmbH. Photo by Frank Korte/Gunter Kamlage/EPA/Landov.